Every year my wife and I have a big discussion about how we should deal with Halloween. I’ll let you know if we ever come up with a good answer. We have five little kids. We don’t want them embracing the world’s standards of good and evil, beautiful and ugly. We’re not excited about lots of candy. And – on the other hand – we think that somehow, somewhere, there’s a good insight in Halloween, and we’re not into just ignoring our culture. Halloween is, of course, really All-Hallow’s Eve, the night before All Saints. 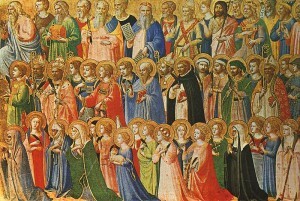 The original insight is something along the lines of, All Saints (Nov 1) remembers those in heaven, All Souls (Nov 2) remembers those in Purgatory – and Hallow’s Eve (Oct 31) remembers the forces of Hell. There’s something to that. Our readings for the feast take us deeper. The first reading is from Revelation. All Saints is an apocalyptic feast. It introduces November, the month of the dying of the year, by turning our gaze toward the end of time. The reading from Revelation speaks of the great battle between the forces of heaven and the forces of hell. It begins with “the four angels who were given power to damage the land and the sea” – the great destruction at the end of time. The saints are gathered around the Lamb, singing his praises. If we read more of Revelation, we know that its central image is “the Lamb who was slain,” a magnificent apocalyptic vision of Christ as victim. The saints themselves are described here as “the ones who have survived the time of great distress; they have washed their robes and made them white in the Blood of the Lamb.” Already we are turning the gore of Halloween inside out: the ax murderers and the zombies are replaced with those bathed in the blood of the Victim. The destroying angels stand for God’s condemnation of the standards of this world. Or, to put it more positively, all things are passing, God alone remains. It is not God who condemns this world, but this world that condemns itself, by clinging to what does not remain and forgetting the one thing necessary. The blood-stained saints have held on to Jesus when all else collapsed. We need to be in this apocalyptic frame of mind to appreciate fully our Gospel reading. It is perhaps the most profound reading in all of Scripture, all of literature: the Beatitudes. We can read them against Halloween. Against pirates and princesses, Christ proclaims, “Blessed are the poor in spirit.” The world dresses up as the powerful and the plunderers – and Christ calls us to imitate him, the powerless who was plundered. While the world celebrates conquest, Christ celebrates those who mourn. The closest the world can get to those who hunger and thirst for righteousness, the merciful, and the peacemakers is superheros. But as the world decides whether to dress up as Batman or a zombie, we see that Christ calls us to a very different kind of heroism, our strength not in superpowers or high-tech weapons, but in the suffering of the Lamb. 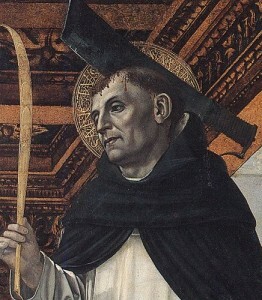 The multitude of saints in Revelation have axes in their heads, not in their hands. In this apocalyptic light we also read our epistle, from First John. “See what love the Father has bestowed on us that we may be called children of God.” How fascinating that, as our children dress up as adults, Christ calls us adults to become as children. Yet avoiding the worldliness that affects our children, too. “The reason the world does not know us is that it did not know him.” We are not called to become children in the sense that we mindlessly embrace the world’s standards of glory and go seeking after candy. We are called to become children in the sense that we take God as our Father, Christ as our model, and the Holy Spirit as our soul and way of life. Halloween reminds us of the world’s standards, the world’s mistaken views of good and evil, of glory and gory. 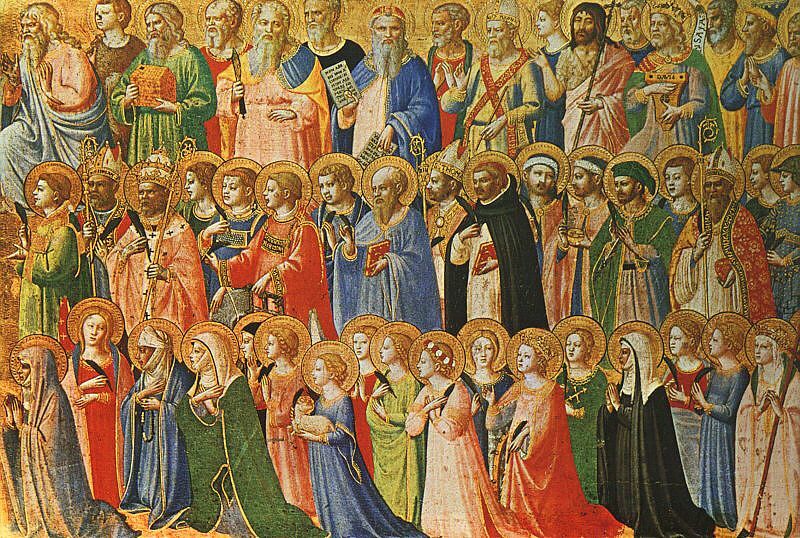 It reminds us that the saints live by an entirely different standard, one that turns worldly values inside out. “Everyone who has this hope based on him makes himself pure, as he is pure.” But part of that purity is seeing the foolishness of this world, associating ourselves with the victims, and the Victim, of this world’s crimes. Like I said, I’ll let you know if I ever figure out how to turn these ideas into a children’s party. But I think it means something deeper than just turning our backs on Halloween, or just embracing it. To truly appreciate All Saints, and the fabulous new standards that it sets before us, we need to look Halloween in the face, and turn it on its head. How does Halloween help you think about the Beatitudes, or the Apocalypse? One of the most inspiring symbols in the Old Testament is “the remnant.” It comes up in various contexts related to the exile. The Assyrians and Babylonians have conquered Israel. The leaders are all led into exile. Both at home and in exile, the Israelites are giving up, blending in with their conquerors. But a remnant remains, a small crew who are still faithful. It’s an inspiring image because we often feel like a remnant. It feels like so many have given up hope, given up faith. In fact, we need to feel like a remnant, to try to be more faithful than the many. But this Sunday’s readings teach us a little about what it really means to be part of the remnant. God says, “Behold, I will bring them back from the land of the north” (that is, from Assyria and Babylon). But so often, in our heroism, we forget that he says, “I will,” and get a little too excited about our own heroism. He continues: “I will gather them from the ends of the world, with the blind and the lame in their midst.” The image is important: the remnant comes staggering home from exile to rebuild the kingdom – and they come limping. It is not the strong who come. The blind and the lame remind us that the battle belongs to the Lord. They have been defeated. But he is stronger. With them come “the mothers and those with child.” The image works on two levels. First, they are another symbol of weakness. Pregnant women are not warriors. They have not conquered, God has. And yet the new life they bring is the most perfect sign of restoration. This is us, the remnant. Not the strong and the heroic. Merely those who are saved. We come limping – and our limping is a sign of God’s strength, made perfect in our weakness. We come as families. But family makes us limp all the more. We have no strength to conquer our enemies. But the Lord is our strength, and in our children, in our pregnancies, in our weakness is the perfect sign of restoration. It is a sign of resurrection, of strength not our own. The Gospel is blind Bartimaeus. It’s an interesting scene: there is “a sizable crowd.” And there is a blind man who “sat by the roadside begging.” He could not see Jesus; he had no resources for knowing about Jesus; and he could not make his way through the crowd. And he is the one who is saved. My friends, serious Catholics talk a lot about rebuilding the culture, or converting the culture. That’s fine. But I think too often we trust in kings. We think that what we really need is impressive people converting impressive people, with lots of impressive resources. Bartimaeus was not an impressive person. Those who rebuilt Israel were not impressive. Our impressive resource is the power of God. Our impressive people are the meek and the humble and the poor: people like Mary and Joseph. No ones. The poor are so critical to rebuilding the culture, because it is by the poor that we measure whether we really believe in the power of God, or whether we talk a bit talk but are “practical atheists,” who think everything depends on our cleverness. The only Christian civilization is the one built around people like Bartimaeus. And, at the center, the Crucified. In our reading from Hebrews, we see Jesus, our high priest. “He is able to deal patiently with the ignorant and the erring.” He has taken on our sins, and comes among us. Let us be the remnant not of the clever and amazing, but of those who put all our trust in the God of Jesus Christ. In what ways are you tempted to think the most important Christians are the most impressive? Our Gospel for this week teaches, “Whoever wishes to be first among you will be the slave of all.” The Lectionary gives us two very helpful readings to help us understand this Gospel. A word on the interpretation of prophecy. A line like this refers both to a historical figure – Isaiah himself, in part – and to the ultimate fulfillment of the prophecy, Jesus. In other words, the Holy Spirit inspires Isaiah to speak about Jesus in terms of his own experience. An important aspect of this is that this experience is not entirely unique to Jesus. Isaiah’s sufferings are not redemptive in exactly the same way Jesus’s are. But there is some connection between their experiences. Jesus has entered into our experience. Which is all just to return to the question: “whom is he talking about?” Well, he’s talking about himself, and about Jesus – and also about us. “The Lord was pleased to crush him in infirmity.” That is mighty strange. Somehow God takes pleasure in our suffering. Why? “He gives his life.” First of all, the Lord is pleased to give us suffering only when we ourselves embrace it. The Lord’s pleasure is not in the suffering, but in the self-giving. And yet self-giving is perfected in suffering. Why? “An offering for sin.” These are rich words. Let us only say, it has to do with sin. It has to do with conversion. Turning sin to righteousness is going to involve suffering. Our own conversion is painful. And our love for those who remain sinners is painful. The Lord is “pleased to crush us” when we embrace the suffering of turning from sin to righteousness. So “the will of the Lord shall be accomplished through him.” The suffering servant embraces suffering as the deepest sign of embraced God’s will. It’s about the will of the Lord, not about suffering – and yet suffering is where we see most clearly whether we embrace God’s will. And so “he shall see his descendants”: because ultimately this is not about death, it is about life. It is not about the Lord crushing us, it’s about welcoming the Lord into our lives, and receiving life from him, and from him alone. The second reading, from our tour through Hebrews, focuses even more directly on Jesus. His suffering is described as a test, a test he passes without sin. Again, it is not about the suffering, but about holding fast no matter what – and yet it is in suffering that we discover whether we hold fast. In short, Jesus is there. Like the fourth son of man in Daniel’s fiery furnace, he walks beside us through the suffering. He makes it a place of springs, a place of grace, a place of divine union. He comes precisely to give us the grace to pass this test. We must be purified of the dross of sin. We must be converted. It’s going to hurt, and it’s in suffering that we will discover what most needs to be purified. But Jesus has come to console us, to give us strength, to give us union as we suffer for our sins and those of others. In our Gospel, James and John seek the glory of Christ. 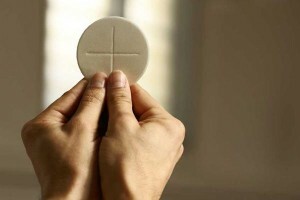 He calls them to drink his cup and be baptized with his baptism: to embrace his Cross. Then he says, “to sit at my right or at my left is not mine to give but is for those for whom it is prepared.” At first glance, we’re tempted to separate this from the cup and the baptism, as if Jesus gives those, and someone else decides about glory. To the contrary, the cup and the baptism are the preparation. There is no entrance into glory except through fire, because there is no entrance except through conversion. And though suffering helps us understand this teaching, Jesus’s words point even deeper: we must be “the slave of all,” purified of our self-worship and transformed into love. 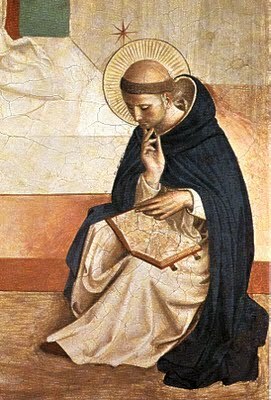 How is suffering calling you to conversion today?